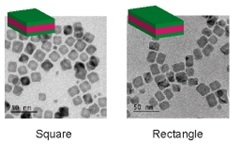 By tuning the parameters of the nanocrystals synthesis reaction, an anisotropic growth can be obtained leading to square or rectangular nanoplatelets (fig. 1). 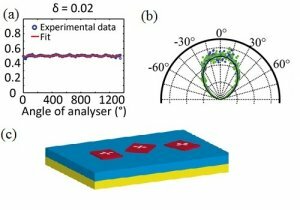 We have developed an analysis method for single nano-emitters combining polarimetric measurement and radiation pattern measurement (Fourier imaging) and also adequate choice of substrate (glass plate, gold layer etc). This method allows us, for different nanoplatelet shapes, to study how emission originates from a single dipole or from an incoherent sum of two or more dipoles, and what is their orientation (fig. 2). This « dipolar nature » of the emission results at the same time from the confinement of the radiation electron-hole pairs in the platelet, and from a radiation modification by a dielectric antenna effect of the platelet. Figure 2 : (a) Polarimetric analysis and (b) radiation patter, (angular distribution of radiation) for a square nanoplatelet. The emission is unpolarized and its radiation pattern is in excellent agreement with (c) a sum of 2 incoherent orthogonal in horizontal plane.